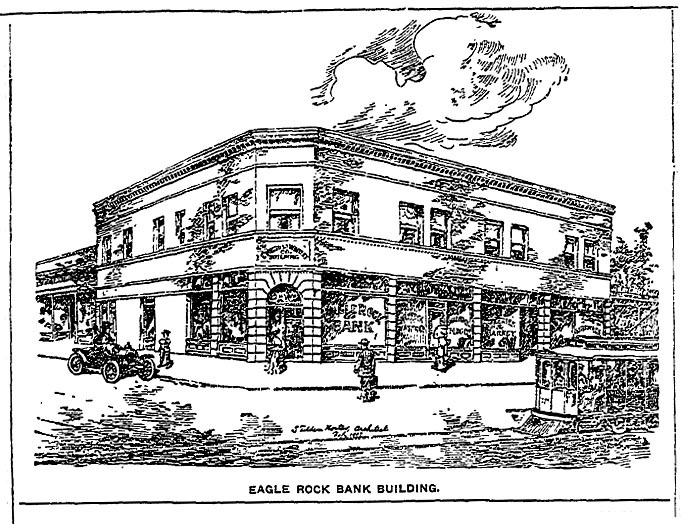 Eagle Rock bank building designed by Samuel Tilden Norton, via Google Street View. Note: This is an encore post from 2007. Architect Samuel Tilden Norton has designed a bank building for Townsend Avenue and Colorado Boulevard in Eagle Rock, The Times says. Just to make research interesting, The Times misspelled his name as S. Tilton Norton. According to his 1959 obituary, his mother was the first Jewish child born in Los Angeles. After studying architecture in Los Angeles and New York, he designed the Wilshire Fox Building and Sinai Temple. He was a board member of Temple B’nai Brith during its move from Hope and 9th Street to Wilshire and Hobart and was an honorary consultant on plans for the temple, which was designed by A.W. Edelman. Norton was lifelong friends with Rabbi Edgar F. Magnin, who presided over the funeral. Norton was a member of many professional, religious and social organizations, including Hillcrest Country Club, Nathan Strauss Israel Society, Jewish Federation, the Friends of the Hebrew University and the Zionist Organization of America. This entry was posted in 1907, Architecture, Black Dahlia, Books and Authors, LAPD, Obituaries, Streetcars and tagged architecture. Bookmark the permalink.